We are often encouraged by Church leaders to make prayer and meditation an important part of our lives, but they have said very little about how to meditate, or what they mean when they use that word. Some people use the word “meditation” as a synonym for “pondering” or “contemplation” but to me there is an important difference. This post is not so much about semantics or word definitions as it is about three important spiritual activities that we need to engage in to grow spiritually. Most of the time the word “prayer” applies to the act of communicating with the Father. It is sometimes done formally, often on bended knee. Other times prayer is less formal, such as when we are in a hurry and ask God to help us find a close parking space or the missing shoe or keys. Readers of this blog know that my personal favorite way to pray is in writing. I write a letter to God most mornings. I think more clearly in writing. Used in this way, as many people do, prayer is a kind of monologue. We give our gratitude and request lists to God, close “in the name of Jesus Christ, Amen,” and get up and go about our business, hoping that we might be able to discern an answer to our prayers during the course of the day, in our scripture reading, or in a talk at church. In my opinion, prayer should be a dialogue, not a monologue. The Lord might be ready and willing to answer our prayers — or at least to speak to us about what is on His mind — as soon as we have said “Amen.” When we get up and go about our business without taking time to listen at the end of our prayers, we don’t give Him a chance to answer. I think that when our leaders use the phrase “prayer and meditation” they mean for us to slow down, quiet our minds, experience the moment, and listen patiently for the voice of the Lord, especially after we have finished praying. Usually His voice comes in the form of thoughts or impressions. It is important to keep in mind that the Lord may or may not speak to us exactly about the same topics we spoke to Him about in our prayer. In my experience, that is often the case. There are other, more formal forms of meditation, such as yoga, transcendental meditation, guided meditations, etc. They also help clear your mind, and experience the moment. Here is a useful meditation technique that takes only two minutes and produces an immediate, noticeable stress relieving effect. This is very helpful in trying to receive personal revelation, or answers to prayers. Sit quietly and close your eyes gently. Focus your attention on the end of your nostrils — the point at which your breath enters and leaves your body. As you inhale, think the first half of the phrase you chose, and as you exhale think the second half. Repeat this exercise slowly three times, then open your eyes. When I do this I can actually feel the stress leave my body, and I am able to think and hear more clearly. Pondering is a way of seeking truth by obtaining and using knowledge gained through study and life experiences. When I ponder a question or topic, I reflect on it, applying what I already know, trying to arrive at truth. Conference talks, studying scripture references listed in the Topical Guide, and/or talking to others are all ways of finding additional knowledge to help me come to an understanding that feels right to me as I ponder an issue. Prayer is the process of communicating with the Father. Meditation is clearing and opening my mind to receiving truth directly from the Lord through the Holy Ghost. Pondering is seeking to find and apply knowledge to come to understand the issue. 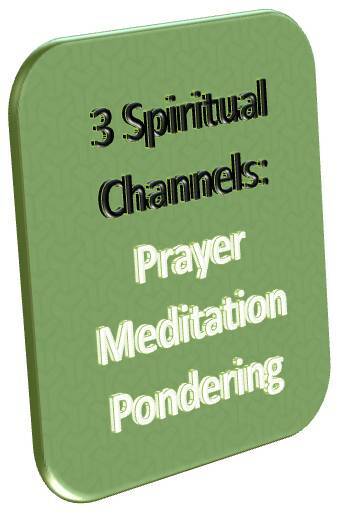 These are three different but important activities that contribute to spiritual growth. Do you place as much priority on listening for answers as you do on praying? Are prayer, meditation and pondering all spiritual activities that you practice? What are you willing to do to improve your ability to to receive personal revelation and answers to prayers?